In their installation 'Parabolic Lightcloud', Renzo B. Larriviere and Simone Chua (amigo & amigo) use more than 1,000 lights to make something invisible visible: our human emotions. With different colour combinations, patterns and transitions they show us intense emotions such as love or happiness, but also calmness or sadness. But don’t be fooled, this effect can work just as well the other way around! A digitally-controlled medium, like this light installation, can have a powerful influence on our mood and our actions without us realising it. The artists based the special shape of 'Parabolic Lightcloud’, the ‘parabola’ (a U-shaped line) on the famous mathematical figure, the Fibonacci spiral. You can, using your imagination, divide this spiral into blocks that become smaller and smaller, each block the same size as the two smaller blocks next to it. Since the spiral is so common in nature – look at the shape of a snail’s shell, or the pattern of seeds in a sunflower, for example – it’s very familiar to us and we often intuitively find objects with similar proportions to be beautiful. In their homeland Australia, amigo & amigo trace this Fibonacci spiral that forms the basis for 'Parabolic Lightcloud' to the underwater world, in the colourful anemones and corals, for example. The duo often bases their work, and more specifically their light sculptures, on forms found in (human) nature. Recent artworks include two fighting roosters made of light, and an interactive installation inspired by nerve cells and the human brain. 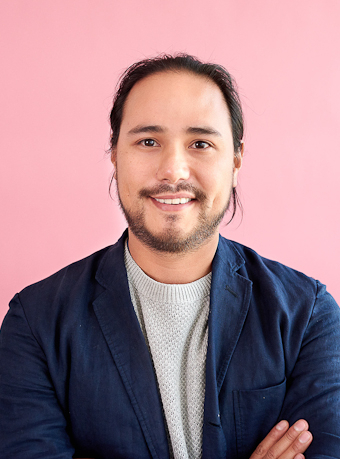 Peruvian artist Renzo B. Larriviere (1985, pictured) and Australian artist Simone Chua (xxxx) met while studying industrial design at the University of Technology in Sydney. They enjoyed working together and started their own light design agency amigo & amigo in 2012. Their large-scale, technically complex light installations are often playful and invite the audience to interact. They are usually positioned in the public space, like their artwork Affinity which was exhibited outside the Museum of Contemporary Art in Sydney in 2015. "As Waterschap Amstel, Gooi and Vecht and Amsterdam Clean Water we are proud to connect our names to the artwork 'Parabolic Lightcloud'. For us, this artwork, of which the net is made from recycled plastic bottles, symbolises all the waste that we collect each day from the Amsterdam canals. We are proud of our canals and together we keep them clean."